Both adults and kids who do not have sufficient speech to communicate well have access to a specialised area of assistive technology called augmentative and alternative communication. At Novitatech, our speech pathologists work with kids and adults, their families and other team members to design the best possible communication system to support them in communicating to their full potential. Augmentative and alternative communication is a type of communication that combines gestures, eye pointing, vocalisations and pointing to symbols as communication for people with limited speech abilities. Augment means to add to or to enhance. For example, we can augment speech by using gestures, eye pointing and body language. Alternative means a choice or a substitute. We can use alternative communication to speech by pointing to symbols, signing or by spelling. This means augmentative and alternative communication (often shorted to AAC) is the term for all communication that is not speech, but other types used to enhance or to replace speech. How will AAC support me or my child? Augmentative and alternative communication systems can assist people who cannot speak to develop language skills and increase participation and inclusion in daily activities. It’s an important tool that can give people more communication control and decrease frustration. Therapists may suggest an augmentative and alternative communication system if speech is slow to develop or non-existent, or as a back-up if speech ability is very limited or difficult to understand. An AAC system may be either a short or a long-term solution to communication difficulties being experienced. Signing – this involves the use of a formal set of signs, or signs which are particular to an individual. Signing is useful to understand language. The sign can be seen and held for slightly longer if needed, whereas speech disappears as soon as it is spoken. Signing can also be used as a means of expression with other people who know signs. PODD Communication Books – ‘Pragmatic Organisation Dynamic Display’, is a way of organising whole word and symbol vocabulary in a communication book or speech generating device, for users to select a word or symbol in communicating. They can have different formats, depending on the individual physical, sensory and communication needs of the person who will use it. Why you could need a combination of AAC types? For all people, the type of communication needed throughout each day varies greatly. For example, we talk with a variety of people, such as friends, strangers, superiors, relatives in a variety of places. You could be in noisy places with a friend, like the football, or a quiet place with a teacher, like the library. We talk for a variety of reasons which is very important to our wellbeing. For example, we use speech not only to communicate our needs with others, but to joke, to talk about an experience, to discuss and also to argue. It is unlikely that any one AAC method or system mentioned above would meet your needs in all of these situations. Everyone who uses AAC often needs a variety of methods and systems to let them communicate throughout the day and night! Ongoing support and assessment of your or your child’s augmentative and alternative communication systems is the key to making it work best for you. Parental involvement (for kids) – successful use of AAC involves support and active involvement of those who are in the child’s immediate environment – parents and caregivers are the key to AAC success. In order to develop and practice communication skills, the child (particularly in the early stages of using AAC) may need some extra encouragement and opportunities to communicate using their AAC system. Communication partners – there are lots of things that communication partners (those who interact with AAC users) can do which make a real difference to the skills an AAC user develops, whether they’re adult or child. Novitatech therapists can advise on how communication partners can support you or your child to develop skills, depending on your personal needs. Vocabulary choices – the words and messages chosen for an AAC system are very important – if they are not useful or motivating to the user or listener, they will not be used. Ongoing evaluation – an AAC system should be ever-changing, matching the needs of the user as they grow, learn and meet new people – communication needs are always changing, and an AAC system should change to meet (or anticipate) these needs. Easy use – for communication to be successful, it needs to happen as easily as possible for the user and as quickly as possible for the listener – many factors will need to be considered to achieve this goal. 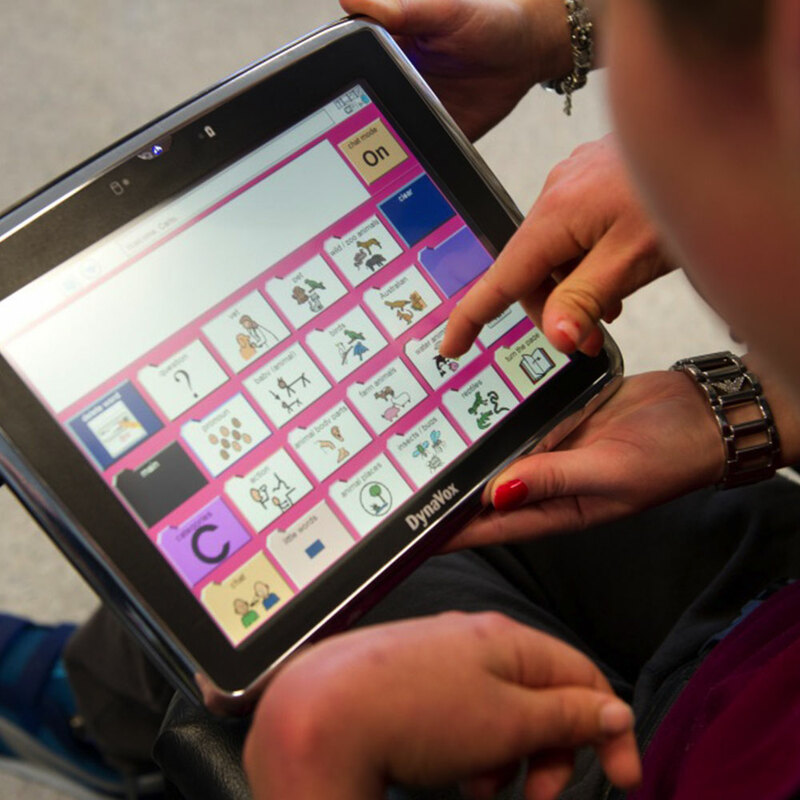 Our experienced Novitatech therapists and clinicians can assess what AAC would work for you or your child, and provide ongoing support. Call Novitatech on 1300 668 482 to book a no-waitlist consultation, or enquire online. There is a large range of methods and tools available in augmentative and alternative communication, and a particular system should only be recommended after looking at the whole communication picture of a potential user. At Novitatech, our multidisciplinary team can assist every step of the way. The best result is obtained when a speech pathologist co-ordinates all the steps involved and they will also work out the most suitable type of AAC methods to use, together with you or your child, your family and other therapists – these people can also be supported by other clinicians from Novitatech’s Assistive Technology Service team if needed. You can make a no-waitlist consultation booking online. When deciding on the best AAC device for a child or adult, it’s important to know that just giving someone an AAC communication system does not mean they will necessarily show an interest in using it – AAC systems are tools, they do not provide the interest or ability to communicate. Prescription of a voice output communication device also requires careful consideration and a variety of information and input from others. Visit the Washington University AAC ‘Understanding AAC Features’ page for more information. Does using AAC hinder the development of speech? Research shows that this isn’t the case, and it can actually assist in developing spoken language. Once you have your AAC system identified, it’s teaching, training and practise that are very important in the success of AAC use. There are a number of different approaches and methods that may be used in AAC training. These include immersion and modelling. Immersion is when all those around the child use the child’s augmentative and alternative communication system when communicating with them. The child should also be expected to use the system. Modelling is demonstrating or showing how to do something by example. Read our blog post on Augmentative and Alternative Communication (AAC) Training for more information or if you would like free advice, speak to someone in our friendly Novita team on 1300 668 482 or visit our Contact Us page. An easy to understand and practical website that provides a wide range of information and guidance to families, teachers, speech/language pathologists and others involved with a child with special communication needs. This site developed by Caroline Musselwhite and Julie Maro, provides access to augmentative and alternative communication intervention products and presentations. This site provides information about severe communication impairment for communication aid users, advocates, therapists, teachers, and rehabilitation engineers. It also provides access to a list serve on augmentative and alternative communication topics. This site, originating in California, provides information about a newsletter, edited by Sarah Blackstone, dedicated to providing a wide range of articles about the field of augmentative communication. The Centre serves organisations and programs that work with families of kids and youth with disabilities. It offers parents, educators and friends a range of information and services on the subject of assistive technology. This international body is committed to providing the latest world-wide information about augmentative and alternative communication. Provides access to the latest assistive technology solutions for people of any age living with disability within Australia. This page of the site provides a glossary of augmentative and alternative communication (AAC) vocabulary and information about AAC products.